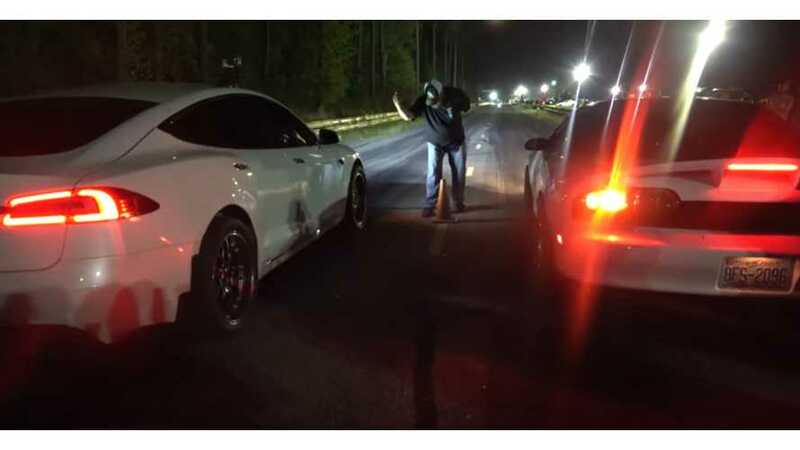 Not surprisingly, a semi-stripped Tesla Model S P100D makes easy work of an 1/8-mile drag challenge, beating five ICE cars ... but wait, there's more to the story. *Editor's Note: Some NSFW language in video. 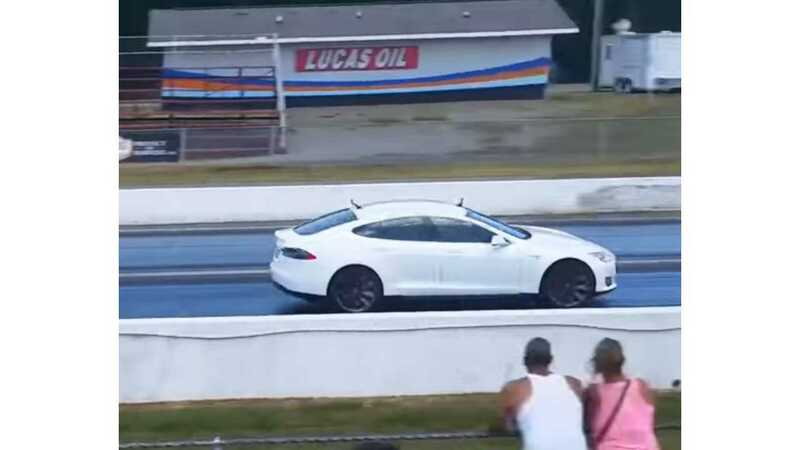 The site is 710 Dragway in Rowland, North Carolina, and Tesla Racing Channel continues to tweak its P100D to top the competition. The car's crazy amount of torque makes it tough to beat on the short race. Just in its standard configuration, the top-of-the-line Model S is capable of zero-to-60 sprints in as low as 2.3 seconds. Strip it down, throw on some lightweight wheels, drag tires; add some system hacks, and put a seasoned driver in the cockpit ... you have yourself a monster. The race is a simulated street race, beginning on a rough track. In the "cash days" event, 19 cars entered (at $100 a pop). The Tesla Model S P100D takes out a Monte Carlo, two Mustangs, a Camaro, and an S-10 pickup truck, for the top cash prize. In the 1/8-mile dash, the Model S in untouchable, however, had these cars continued down the track, the P100D would have been out of luck in the long run. The ICE racing population is well aware of this fact. It is all too common to share stories of electric cars' torque and speed off the line, just to have ICE car fans immediately argue that the gas car is better for the long haul, and the top speed. Remember our Demon post? Anyway, a Camaro owner is unhappy with the results of the cash days challenge, so he makes up a challenge of his own for the Tesla Model S driver. The Camaro driver is so confident, he lets the Model S take off first (not smart). The Model S blows him away. Did he offer the break so that he and the crowd could hold it against the Tesla driver after he lost? It seems he was in need of a good excuse in advance. It gets a bit heated as the Camaro driver and the crowd call Tesla Racing out for the cheap head start. There are many other words that we would rather not share. A semi-gutted Tesla P100D with BBS Wheels and M/T tires takes over a cash days style street race. 19 Entries = $1900 and 5 rounds of tough racing. This road isn't ordinary with it being some of the worst conditions going backwards down the dragstrip, starting at the other end of 710 Dragway. As for after the show...someone always wants to grudge race and well there's always a winner and a loser in that situation when the Tesla talks its way into getting the brake.